Abstract : Explained is the design of a parameterized saturating compression curve. 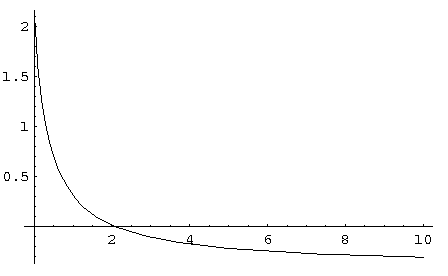 The goal is to create a smooth curve that levels out at a specified maximumvalue when the input reaches its maximum. 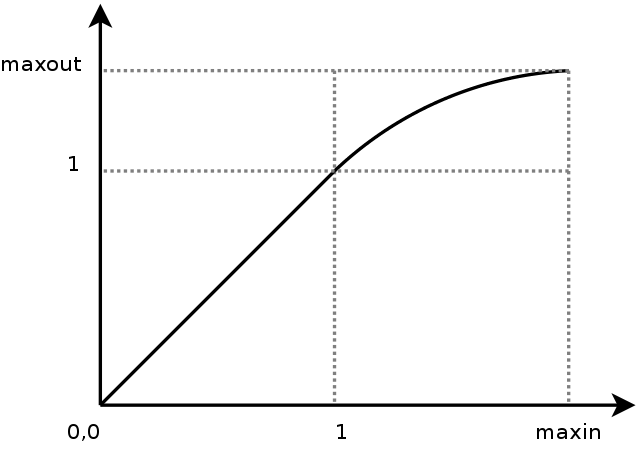 The goal is to create a compression curve that will start at a threshold of 1 with a slope of 1 (the differential is thus 1) and arrive at the maximumvalue with a slope of 0 (the differential at maxin is thus 0). The curve should be 'smooth' accross the entire compression range. Preferably in such a manner that the change from one value to the next is merely a matter of multiplying. In words: never overshoot the maximal output value (maxout) and be strictly increasing. An extra requirement that we found was that, allthough the function must be strictly increasing, it must do so in a manner that is gradual, thus we also want that the speed by which the function slows down is strictly decreasing. The strategy that finally succeeded in cracking this beast was to create an appropriate differential function f' (striclty decreasing, reaching zero at the appropriate time). 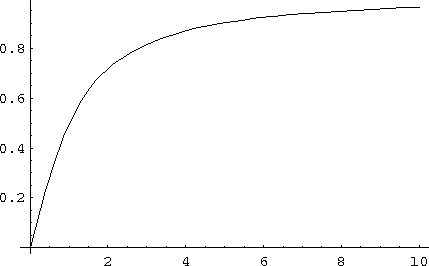 The integral of f' would then be the compression curve and will reach a certain maximum value at value i. That point should then coincide with the required output value o. To make it possible to reach that outputvalue we should be able to control the volume under f'. The easiest manner to achieve this, is to parameterize the bend of f'. Also here, a number of attempts were made to use quadratic, cubic curves etcetera. Nevertheless, none were really satisfactory because we also learned that f' had to be symetric around the diagonal. This can be written as f(f(x))=x. That brought us to the following strategy. 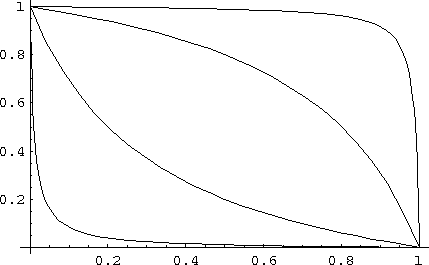 We first create a diagonally symmetric function f' that is parameterized by a 'bend' factor. That bend factor allows us to modify the volume under f'. As soon as we then integrate f' we obtain the compression curve f and can choose the correct bend value as to reach the outputvalue o. We are looking for a symmetric function s(s(x))=x . Because the function 1/x is such a function, it is worthwhile to start working from there. However, because we eventually will want to have s(0) with a sensible value (and not infinity), we also add an extra term. That term, if sufficiently large will likely help us to affect the bend of the curve. The above picture shows two instantiations of this function. The left one with a=0.1. The right one with a=0.4. The problem with s is that its value at 0 is not always 1 and that its zero crossing is somewhat arbitrary as well. To bring the value at s(0) to 1 we first divide the output of s by s(0,a), which is the value. 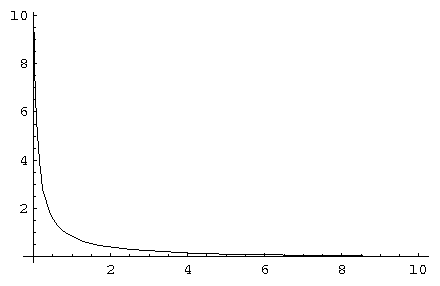 g for values a=0.1, a=0.5, a=2 and a=10. 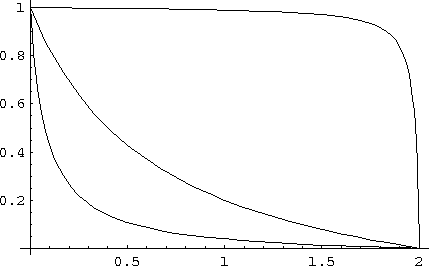 The maximum input value was 2 for each curve. The compression segment is now the integral of g. Thereby we assume that a>0 , that a!=1, that i>0, that x<i and that x>0. 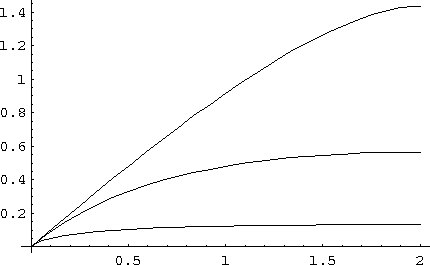 Demos of the compression segment f, with value for a=0.15, a=0.5, a=2. i=2 in all cases. To obtain a correctly scaled compression segment, it is tempting to merely scale the output of f. That would however screw up the requirement that f'(0)=1. Consequently we are looking for the correct value of a that will lead to an output value of correct order. The maximum output is found at position i. The problem now is that solving m is not straightforward, and as far as I see it, requires numeric approximation. Nevertheless, once the a-value is found for which m(a)=o/i, then that value can be inserted into f, together with i and we have the segment calculated as required. Interesting is that the limit of m is 1, we can thus never deal with sitautions where maxOutput>maxInput.